Time to reorganise my sewing room. Here are some “during” photos. As you can see I found it very difficult to find enough room to sort stuff in order to reorganise it. 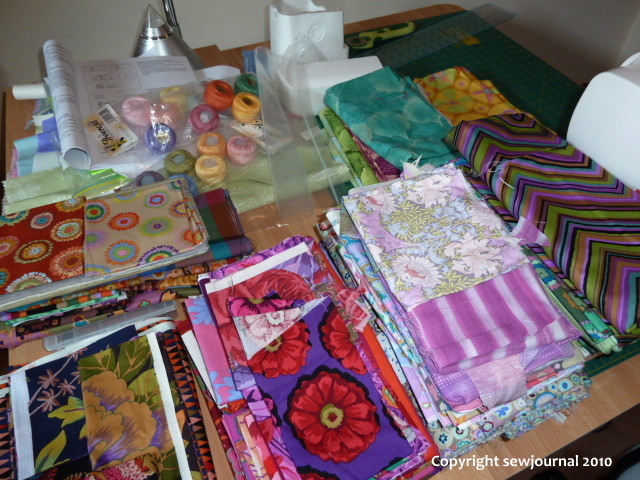 But I did get the fabric organised before I had to stop for the night. As you can see the bookcase is looking pretty spiffy! The rest of the room however needs work and that’s this afternoon’s job. Wish me luck! 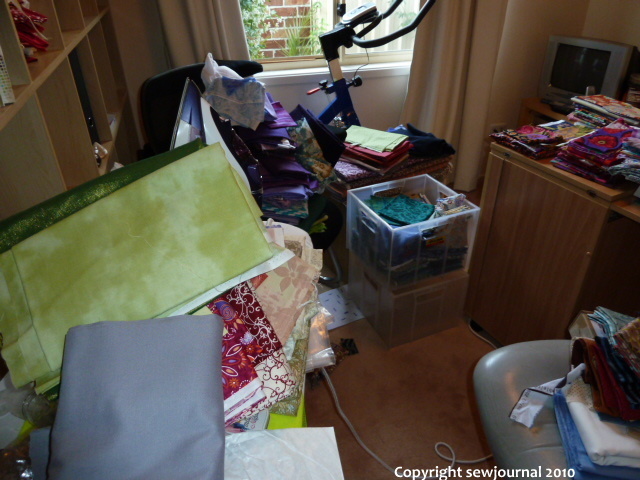 I wish I had a sewing room , even one that is not organized. i have a super king bed and i use it as my cutting surface ( with cutting board ) etc. I have to clear the bed every night to go to bed and out comes everything again in the morning. I love making my bags and experimenting with coordinating and combining for them. I make my own patterns and I am excited to see if they turn out like I envision them. Fun, fun, fun.I have all new ones on my website since last Friday and adding more every day. Good luck with organizing your sewing room. I love reorganising, I find all sorts of stuff that I’ve forgotten about..!! Your shelves do look good, have fun with the rest of the room..
Oh well done! 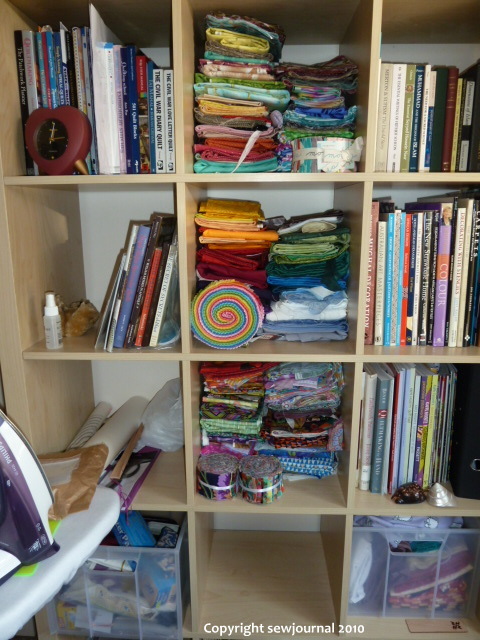 I’ve only just moved into a new sewing room and already it is chaos. I find I just can’t work neatly. My stash however is nicely stored in plastic lidded tubs in colour batches so at least one thing is tidy. I wish I had a sewing room. What am I saying? I wish I had a bedroom, too! I live in a studio apartment and sleep in a Murphy bed!! 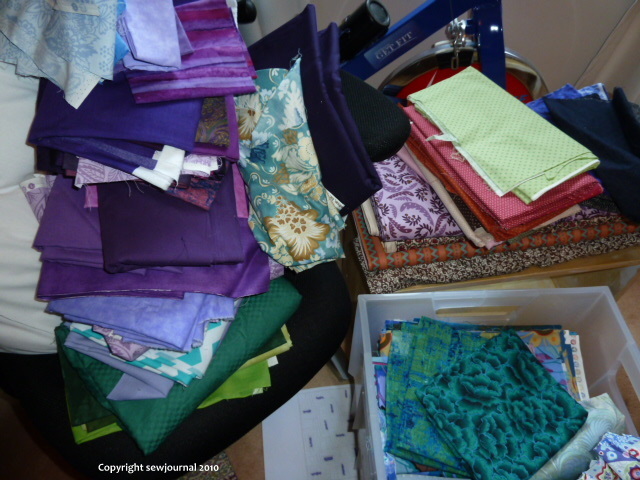 I have to clean up from any sewing session and so I think a sewing room would be a wonderful luxury! Good luck with your task. When you are done, you’ll be so happy as you look around at your accomplishment. It will be a joy. Gosh Holly you must be really organised. I don’t know how I’d manage. Although when I was a student I lived in one room so I guess when you have to, you have to.